Google Book Search: You can use Google Book Search to search for specific subjects in thousands of books available through the Google Book Search - both books under copyright and in the public domain. Hundreds of books are added regularly, so check back if you do not find books on the subject for which you are seeking information. Some of the books published prior to 1923 are available in their entirety and can be downloaded to you computer for your personal use. 1862 Map of Will County, Illinois, by S. H. Burhans and J. Van Vechten, Illinois: Chicago. 1873 Combination Atlas Map of Will County, Illinois, Thompson Bros. & Burr, Illinois: Elgin. 1897 Sanborn Map of Chicago, Vol. D., Sanborn-Perris Map Co., Illinois: Chicago. 1976 Atlas and Plat Book, Will County, Illinois, Will County Farm Bureau, Illinois: Joliet. Abstract Reports of General Session, Forum on Researches in Progress, and Symposium on Needed Researches, presented at Fourth Annual Mineral Industries Conference of Illinois, "Research on the State's Mineral Resources and Their Utilization," Urbana, Illinois, April 24-25, 1936 - Circular 18: “Rock and Rock Products Sessions,” Illinois State Geological Survey, 1936, 9 pp. Abstracts of Papers Dealing with Rock and Rock Products Presented at the Third Annual Mineral Industries Conference of Illinois, May 17-18, Circular 12, 1935, Illinois State Geological Survey, 8 pp. Acid Etching in the Study of Limestone and Dolomites, Circular 156, by J. E. Lamar, Illinois State Geological Survey, 1950, 47 pp. Age of the Springville Shale (Mississippian) of Southern Illinois, Circular 254, by Charles Collinson and Alan J. Scott, Illinois State Geological Survey, 1958, 12 pp. Agricultural Limestone in Illinois in 1930-1931, Circular 2, by W. H. Voskuil, Illinois State Geological Survey, 1932, 4 pp. Agricultural Limestone Distribution in 1932, Circular 6, by W. H. Voskuil, Illinois State Geological Survey, 1933, 4 pp. Agricultural Limestone Distribution in 1933, Circular 8, by W. H. Voskuil, Illinois State Geological Survey, 1934, 8 pp. Agricultural Limestone Distribution in 1934, Circular 9, by W. H. Voskuil, Illinois State Geological Survey, 1935, 7 pp. Agricultural Limestone Distribution in 1935, Circular 13, by W. H. Voskuil and W. A. Newton, Illinois State Geological Survey, 1936, 8 pp. Agricultural Limestone Distribution in 1936: Preliminary Report, Circular 20, by W. H. Voskuil and W. A. Newton, Illinois State Geological Survey, 1937, 9 pp. Agricultural Limestone Distribution in 1938, Preliminary Report, Circular 47, by W. H. Voskuil and G. N. Oliver, Illinois State Geological Survey, 1939, 10 pp. Agricultural Limestone Distribution in Illinois in 1939: Preliminary Report, Circular 61, by W. H. Voskuil and G. N. Oliver, Illinois State Geological Survey, 1940, 7 pp. Agricultural Limestone Distribution in Illinois in 1940: Preliminary Report, Circular 72, by W. H. Voskuil and G. N. Oliver, Illinois State Geological Survey, 1941, 9 pp. Agricultural Limestone Used in Illinois in 1941: Preliminary Report, Circular 82, by W. H. Voskuil, D. F. Stevens, and G. N. Oliver, Illinois State Geological Survey, 1942, 10 pp. 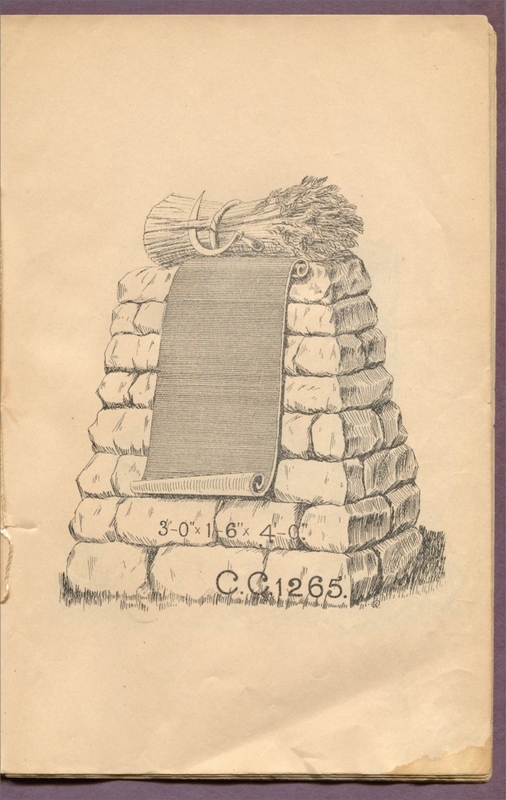 Agricultural Limestone Resources of Illinois, Their Character and Occurrence and Methods of Examination, Circular 94, by J. E. Lamar, Illinois State Geological Survey, 1943, 33 pp. 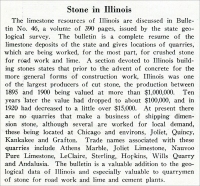 Agricultural Limestone Used in Illinois in 1942: Preliminary Report, Circular 96, by Walter H. Voskuil and Douglas F. Stevens, Illinois State Geological Survey, 1943, 7 pp. Agstone Used in Illinois in 1944: Preliminary Annual Report, Circular 119, by Walter H. Voskuil and Douglas F. Stevens, Illinois State Geological Survey, 1945, 8 pp. Agstone Used in Illinois in 1945, Circular 123, by Walter H. Voskuil and Douglas F. Stevens, Illinois State Geological Survey, 1946, 9 pp. Agstone Used in Illinois in 1946, Circular 132, by Walter H. Voskuil, Douglas F. Stevens, and Ethel M. King, Illinois State Geological Survey, 1947, 9 pp. 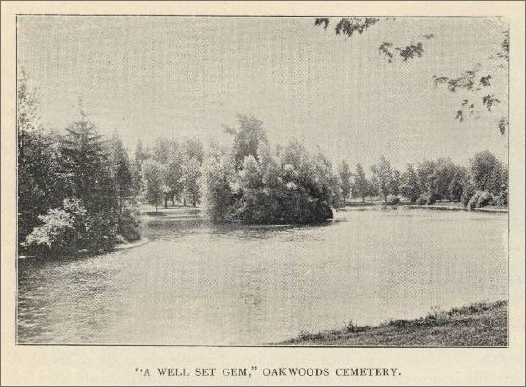 “An Ancient Cemetery at the World’s Fair” (in Chicago, Illinois) from The Monumental News, September 1893. “The burial customs of the ancient Peruvians are curiously illustrated in a section of an old graveyard which is to be seen in the Anthropological building at the World’s Fair…Not even the approximate date of their existence on the earth is known, but it must have been long centuries ago, for the graveyard of Ancon…was in existence before the Spaniards conquered Peru. Annotated Selected List of Industrial Minerals Publications, Illinois Mineral Notes 25, compiled by J. E. Lamar, Illinois State Geological Survey, 1966, 16 pp. Annual Statistical Report, 1996, Springfield, Illinois, Illinois Department of Natural Resources, Illinois Office of Mines and Minerals, 30 pp. Annual Statistical Report, 1997, Springfield, Illinois, Illinois Department of Natural Resources, Illinois Office of Mines and Minerals, 30 pp. Annual Statistical Report, 1998, Springfield, Illinois, Illinois Department of Natural Resources, Illinois Office of Mines and Minerals, 27 pp. Annual Review, 1997, United States Geological Survey, U. S. Department of the Interior, Mineral Industry Surveys, Illinois, 1997, 7 pp. Annual Review, 1998a, United States Geological Survey, U. S. Department of the Interior, Mineral Industry Surveys, Illinois, 1998a, 39 pp. Annual Review, 1998b, United States Geological Survey, U. S. Department of the Interior, Mineral Industry Surveys, Illinois, 1998b, 28 pp. Annual Review, 1998c, United States Geological Survey, U. S. Department of the Interior, Mineral Industry Surveys, Illinois, 1998c, 9 pp. Annual Review, 1998d, United States Geological Survey, U. S. Department of the Interior, Mineral Industry Surveys, Illinois, 1998d, 11 pp. Annual Review, 1998e, United States Geological Survey, U. S. Department of the Interior, Mineral Industry Surveys, Illinois, 1998e, 8 pp. Annual Review, 1998f, United States Geological Survey, U. S. Department of the Interior, Mineral Industry Surveys, Illinois, 1998f, 5 pp. Architects Contribute to Illinois Development, Circular 117, by Joseph F. Booton, Illinois State Geological Survey, 1945 (Reprinted from Illinois Public Works, v. 2, no. 3, pp. 10-15, 1944. ), 6 pp. 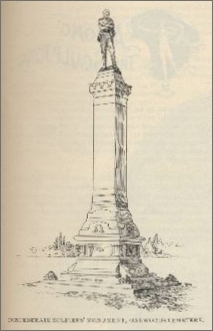 Art Monuments, published by E. C. Willison, Boston and Chicago, 1895. The following information is from The Monumental News, “Among Our Advertisers” section, August, 1895, Vol. 7, No. 8, Chicago, Illinois, pp. 517. Author Index of Illinois State Geological Survey Publications through September 1995, Open File Series 1995-9, Illinois State Geological Survey, compiled by Gary B. Dreher, 1995, 23 pp. Base Map of Illinois (Map). Published by U.S. Geological Survey, 1987. Scale, 1:500,000 or approximately 1 inch = 8 miles. Size, 32 x 54 inches. Shows county and township lines, towns, and railroads in black, rivers and lakes. Base Map of Illinois (Map). Published by U.S. Geological Survey, 1972. Scale, 1:1,000,000 or approximately 1 inch = 16 miles. Size, 17 x 27 inches. Shows county and township lines, towns, railroads, rivers, and lakes. Bedrock Geology Map, Jo Daviess County, Illinois(Map), Open File Series m 2000-8d, Christopher S. McGarry, Illinois State Geological Survey, 2000, Scale, 1:62,500, 29 x 48 inches. Computer- generated map. Bedrock Geology of Bethalto Quadrangle, Madison and Macoupin Counties, Illinois (Map), Open File Series 2003-15, by Joseph A. Devera, Illinois State Geological Survey, 2003, Size, 44 x 36 inches, Scale, 1:24,000. Bedrock Geology of Boone and Winnebago Counties, Illinois(Map), Christopher S. McGarry, Illinois State Geological Survey, 2000, Scale, 1:100,000, Size, 25 x 33 inches. Bedrock Geology of Carroll County, Illinois (Map), Open File Series m 1997-13d, by Christopher S. McGarry, Illinois State Geological Survey, 1997, Scale, 1:62,500, Size, 26 x 44 inches. Bedrock Geology of Prairietown Quadrangle, Madison and Macoupin Counties, Illinois (Map), Open File Series 2003-14, by F. Brett Denny, Illinois State Geological Survey, 2003, Size, 48 x 36 inches, Scale, 1:24,000. Bedrock Geology of the Paducah 1° x 2° Quadrangle, Illinois, Kentucky, and Missouri, Bulletin 102, by W. John Nelson, Illinois State Geological Survey, 1996, 40 pp. Bedrock Surface Topography Map, Jo Daviess County, Illinois (Map), Open File Series m 2000-8e, Christopher S. McGarry and Matthew H. Riggs, Illinois State Geological Survey, 2000, Scale, 1:62,500, 29 x 41 inches, Computer-generated map. Bedrock Topography of Boone and Winnebago Counties, Illinois (Map): Open File Series m 2000-3, Christopher S. McGarry; modified from A. N. Stecyk, Illinois State Geological Survey, 1984. 2000. Scale, 1:100,000. Size, 22 x 23 inches. Bedrock Topography of Carroll County, Illinois (Map), Open File Series m 1997-13e,Christopher S. McGarry, Illinois State Geological Survey, 1997, Scale, 1:62,500, Size, 27 x 36 inches. Bedrock Topography of Illinois, Bulletin 73, by Leland Horberg, Illinois State Geological Survey, 1950, 111 pp. Bedrock Topography of Lee County, Illinois (Map), Open File Series m 1999-1d,compiled by Christopher S. McGarry, Illinois State Geological Survey, 1999, Scale, 1:62,500, Size, 30 x 46 inches. Bedrock Geology of Lee County, Illinois(Map), Open File Series m 1999-1e,compiled by Christopher S. McGarry, Illinois State Geological Survey, 1999, Scale, 1:62,500, Size, 30 x 55 inches. Bibliography and Index of Illinois Geology through 1965, Bulletin 92, by H. B. Willman, Jack A. Simon, Betty M. Lynch, and Virginia A. Langenheim, Illinois State Geological Survey, 1968, 373 pp. Bibliography and Index of Illinois Geology 1966-1996, Bulletin 105, by Lynne Raymond Martin, Illinois State Geological Survey, 2001, 446 pp. Bibliography and Index of Illinois Geology, 1979, Open File Series 1979-1, Illinois State Geological Survey, (Selected from publications indexed in GeoRef in 1979.) Falls Church, VA: American Geological Institute, 1980, 27 pp. Bibliography and Index of Illinois Geology, 1980, Open File Series 1980-1, (Selected from publications indexed in GeoRef in 1980.) Falls Church, VA: American Geological Institute, Illinois State Geological Survey, 1981, 46 pp. Bibliography and Index of Illinois Geology, 1981, Open File Series 1981-1, ( Selected from publications indexed in GeoRef in 1981.) Falls Church, VA: American Geological Institute, Illinois State Geological Survey, 1982, 58 pp. Bibliography and Index of Illinois Geology, 1982, Open File Series 1982-1, (Selected from publications indexed in GeoRef in 1982.) Falls Church, VA: American Geological Institute, Illinois State Geological Survey, 1983, 45 pp. Bibliography and Index of Illinois Geology, 1983, Open File Series 1983-1, (Selected from publications indexed in GeoRef in 1983.) Falls Church, VA: American Geological Institute, Illinois State Geological Survey, 1984, 58 pp. Bibliography and Index of Illinois Geology, 1984, Open File Series 1984-1, (Selected from publications indexed in GeoRef in 1984.) Falls Church, VA: American Geological Institute, Illinois State Geological Survey, 1985, 72 pp. Bibliography and Index of Illinois Geology, 1985, Open File Series 1985-1, (Selected from publications indexed in GeoRef in 1985.) Falls Church, VA: American Geological Institute, Illinois State Geological Survey, 1986, 66 pp. Bibliography and Index of Illinois Geology, 1986, Open File Series 1986-1, (Selected from publications indexed in GeoRef in 1986.) Falls Church, VA: American Geological Institute, Illinois State Geological Survey, 1987, 50 pp. Bibliography and Index of Illinois Geology, 1987, Open File Series 1987-1, Selected from publications indexed in GeoRef in 1987.) Falls Church, VA: American Geological Institute, Illinois State Geological Survey, 1988, 49 pp. Bibliography and Index of Illinois Geology, 1988, Open File Series 1988-1, [Selected from publications indexed in GeoRef in 1987.] Falls Church, VA: American Geological Institute, Illinois State Geological Survey, 1989, 33 pp. Bibliography and Index of Illinois Geology, 1989, Open File Series 1989-4, [Selected from publications indexed in GeoRef in 1989.] Falls Church, VA: American Geological Institute, Illinois State Geological Survey, 1990, 44 pp. Biennial Report for 1913 and 1914, Bulletin 38, Administrative Report and Economic and Geological Papers, Illinois State Geological Survey, 1917, 161 pp. Black and Brown Terrazzo Chips from Southern Illinois Limestones, Illinois Mineral Notes 15, by Richard D. Harvey, Illinois State Geological Survey, 1962, 7 pp. Bruner & Lay: Manufacturers of Marble, Stone, Granite and Bricklayers’ Tools, Stone Jacks, Derricks, and Contractors’ Supplies (Catalog), Bruner & Lay, Chicago, Illinois. Building for the Centuries: Illinois, 1865 to 1898, by John H. Keiser, University of Illinois, October 1977. “The Building Interests,”Industrial Chicago, Vol. I, Chicago: Goodspeed Publishing Co., 1891. Caves of Illinois, Report of Investigation 215, J Harlen Bretz and S. E. Harris, Jr., Illinois State Geological Survey, 1961, reprinted 1966, 87 pp. “‘The Celebrated Joliet Marble Fields: An Historical Geography of the Lower Des Plaines Valley Limestone Industry,” by Linda T. Pote,in Time and Place in Joliet: Essays on the Geographical Evolution of the City, edited by Michael Conzen, Chicago: University of Chicago Committee on Geographical Studies, 1988. “The Cemeteries of Chicago: A Phase of Land Utilization,” by William D. Pattison, in Annals of the Association of American Geographers, 45.3, September 1955. Central Northern Illinois, Guidebook 2, by J. S. Templeton and H. B. Willman, 1952. (Tri-State Geological Society 16th Annual Field Conference, October 11-12, Dixon, Illinois.) 47 pp. 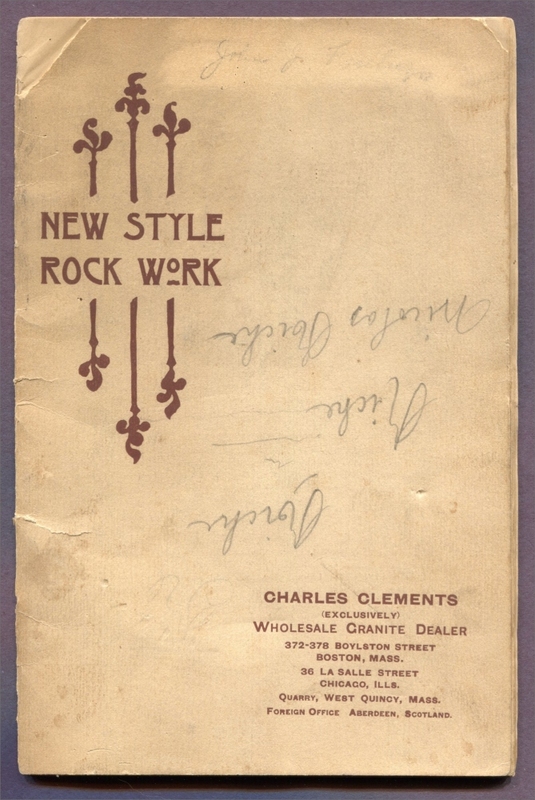 Charles Clements, Wholesale Granite Dealer − New Style Rock Work Cemetery Monumental Catalog, 1890s, 372-378 Boylston Street, Boston, Massachusetts – 36 La Salle Street, Chicago, Illinois − Quarry, West Quincy, Mass. – Foreign Office Aberdeen, Scotland. Chemical and Physical Character of the Pennsylvanian Sandstones in Central Illinois, Circular 331, by James C. Bradbury, Meredith E. Ostrom, and J. E. Lamar, Illinois State Geological Survey, 1962, 43 pp. Chemistry and Technology of Lime and Limestone, by Robert Boynton, New York: John Wiley & Sons, Inc., 1980. Chemical Composition of Some Deep Limestones and Dolomites in Livingston County, Illinois, Illinois Mineral Notes 20, by James W. Baxter, Illinois State Geological Survey, 1964, 5 pp. Chicago: Rising From The Prairie, by Richard Cahan. This book is available through the Landmarks Preservation Council of Illinois. “Chicago’s Ethnic Cemeteries,” by Helen Sclair, in Ethnic Chicago, ed. Melvin G. Holi and Peter d'A. Jones, 1995. Classification of the Genevievian and Chesterian (Late Mississippian) Rocks of Illinois, Report of Investigation 216, D. H. Swann, Illinois State Geological Survey, 1963, 91 pp., 1 pl., 23 figs., glossary. Classification of the Pennsylvanian Rocks of Illinois as of 1956, Circular 217, by Harold R. Wanless. Correlation Chart compiled by Raymond Siever, Illinois State Geological Survey, 1956.,14 pp. Classification of the Pennsylvanian Strata of Illinois, Report of Investigation 214, R. M. Kosanke, J. A. Simon, H. R. Wanless, and H. B. Willman, Illinois State Geological Survey, 1960, 84 pp. 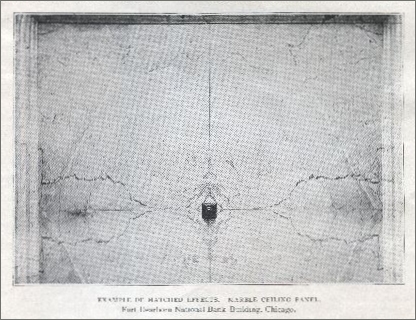 “Concrete Materials Produced in the Chicago District,” by E. F. Burchard, in Cement and Concrete Materials, U. S. Geological Survey, 1908, pp. 383-410. Contributions of the Fifth Annual Mineral Industries Conference in 1937, Circular 23, Illinois State Geological Survey, 1938, 240 pp. Correlation of the "Boskydell Sandstone" and Other Sandstones Containing Marine Fossils in Southern Illinois Using Palynology of Adjacent Coal Beds, Circular 553, by Russel A. Peppers, Illinois State Geological Survey, 1993, 18 pp. A Cross Section of Sub-Trenton Rocks from Wood County, West Virginia to Fayette County, Illinois, by W. L. Calvert, Ohio Division Geological Survey Report Inv. 48, 1963a, 33 pp. Crystal Chemistry and Differential Thermal Effects of Dolomite, Report of Investigation 167, W. F. Bradley, J. F. Burst, and D. L. Graf, Illinois State Geological Survey, 1953. (Reprinted from American Mineralogist, v. 38,pp. 207-217, 1953.) 11 pp. Directory of Illinois Limestone and Dolomite Producers, Mineral Economics Brief 1, by W. L. Busch, Illinois State Geological Survey, 1961, 21 pp. Directory of Illinois Limestone and Dolomite Producers, Mineral Economics Brief 25, by W. L. Busch, Illinois State Geological Survey, 1969, 27 pp. Directory of Illinois Mineral Producers, Mineral Economics Brief 8, by W. L. Busch, Illinois State Geological Survey, 1964, 10 pp. Directory of Illinois Mineral Producers, Mineral Economics Brief 23, by W. L. Busch, Illinois State Geological Survey, 1968, 10 pp. Directory of Illinois Mineral Producers, Mineral Economics Brief 29, by W. L. Busch,, Illinois State Geological Survey, 1971, 12 pp. Directory of Illinois Mineral Producers, 1974, Illinois Mineral Notes 64, compiled by Ramesh Malhotra and Portia A. Smith. 1976, Illinois State Geological Survey, 119 pp. Directory of Illinois Mineral Producers, 1986-1987, Illinois Mineral Notes 96, by Irma E. Samson and John M. Masters, Illinois State Geological Survey, 1987, 151 pp. Directory of Illinois Mineral Producers 1988-1989, Illinois Mineral Notes 103, by Irma E. Samson and John M. Masters, Illinois State Geological Survey, 1990, 134 pp. Directory of Illinois Mineral Producers 1992, Illinois Minerals 109, by Irma E. Samson and John M. Masters, Illinois State Geological Survey, 1992, 129 pp. Directory of Illinois Stone, Sand, and Gravel Producers 1983, Illinois Mineral Notes 89, by compiled by Irma Samson, Illinois State Geological Survey, 1984, 161 pp. Directory of Illinois Stone, Sand and Gravel Producers, 1985, Illinois Mineral Notes 91, compiled by Irma Samson, Illinois State Geological Survey, 1985, 161 pp. Display of Promising Interior and Exterior Building Stones of Northern and Western Illinois, Circular 7, Illinois State Geological Survey, 1934, 1 pp. Dolomite, Limestone, Cement, and Lime Produced in Illinois in 1942: Preliminary Report, Circular 99, by Walter H. Voskuil and Douglas F. Stevens, 1943, 7 pp. Dolomite Resources of Boone and De Kalb Counties, Circular 379, by James C. Bradbury, Illinois State Geological Survey, 1965, 22 pp. Dolomite Resources of Northeastern Illinois (Map) (Cook, Du Page, Kane, Lake, McHenry, and Will Counties ), James C. Bradbury, 1977, Scale 1:126,620, Size 48 x 35 inches. Computer plot. Early Pennsylvanian Geology and Paleobotany of The Rock Island County, Illinois Area, Report of Investigation 37, Part I. Geology, by R. I. Learly, Illinois State Geological Survey, Springfield: 1981, 88 pp. “Economic and Surficial Geology of the Joliet Quadrangle,” Plate Number 1 in Geology and Mineral Resources of the Joliet Quadrangle, Bulletin No. 51, by D. J. Fisher, State of Illinois Department of Registration and Education, Division of the State Geological Survey, 1925. Exploring the Land and Rocks of Southern Illinois: A Geological Guide, by Stanley Edwards Harris, Southern Illinois University Press, 1977, 240 pp., ISBN: 0809307405. From Businessman to Congressman: The Careers of Martin B. Madden, by Thomas Robert Bullard, Ph.D. Dissertation in History, The University of Chicago, 1973. Geologic Information: Cornerstone of Land-Use Decisions, Illinois State Geological Survey Annual Report, 2000, 36 pp. Geologic Map of Illinois (Map). H. B. Willman and others. 1967 edition. Scale, 1:500,000 or approximately 1 inch = 8 miles. Size, 40 x 56 inches. In color. Shows geologic formations; includes generalized columnar sections for southern and northern Illinois and cross sections illustrating geologic structure of the state. Geologic Road Map of Illinois: Surface Deposits and Landscapes (Map). David A. Grimley, Barbara J. Stiff, Michael J. Andrew. 2001. Scale, 1:760,320 or one inch equals approximately 12 miles. Size, 36 x 36 inches. The Geological Map of Illinois, Bulletin 1, by Stuart Weller, Illinois State Geological Survey, 1906, 26 pp. The Geological Map of Illinois, Bulletin 6, by Stuart Weller. 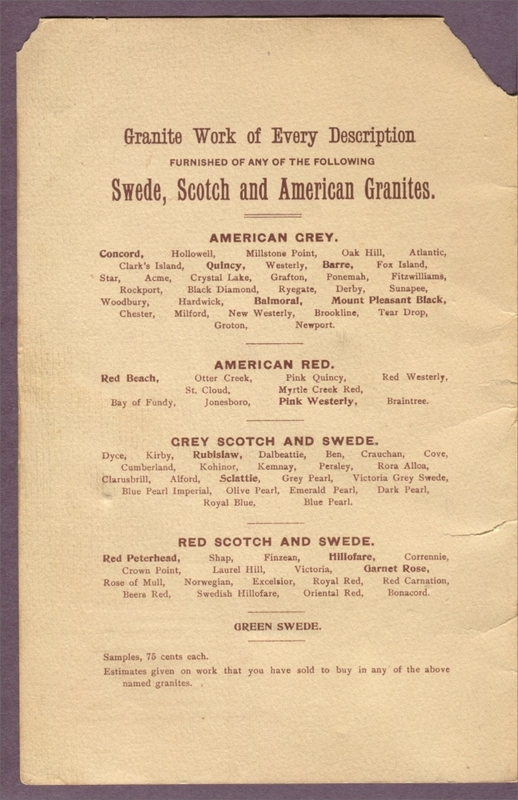 Second edition, Illinois State Geological Survey, 1907, 34 pp. Geology, Vol. I, by Worthen and his assistants Henry Engelmann, H. C. Freeman, and H. M. Bannister, Geological Survey of Illinois, 1868. Geology Along the Illinois Waterway: A Basis for Environmental Planning, Circular 478, by H. B. Willman, Illinois State Geological Survey, 1973, 48 pp. Geology and Economic Resources of the St. Peter Sandstone of Illinois, Illinois Geological Survey Bulletin 53, by J. E. Lamar, 1927. Geology and Geography of the Galena and Elizabeth Quadrangles, Bulletin 26, by Arthur C. Trowbridge and Eugene Wesley Shaw. History of Development of Jo Daviess County, Bernard H. Schockel, Illinois State Geological Survey, (in cooperation with U.S. Geological Survey), 1916, 233 pp. Geology and Geography of the Wheaton Quadrangle, Bulletin 19, by Arthur C. Trowbridge, Illinois State Geological Survey, 1912, 79 pp. Geology and Mineral Deposits of The Laharpe, Good Hope, Morris, and Kings Quadrangle and The Geology of Northeast Adams County, Bulletin 43, by T. E. Savage, et al., Urbana: 1923, 338 pp. Geology and Mineral Resources of the Alexis Quadrangle, Bulletin 57, by Harold R. Wanless, Illinois State Geological Survey, 1929, 230 pp. The Geology and Mineral Resources of the Avon and Canton Quadrangles, Bulletin 38B, by T. E. Savage, Illinois State Geological Survey, 68 pp. Geology and Mineral Resources of the Beardstown, Glasford, Havana, and Vermont Quadrangles, Bulletin 82, by Harold R. Wanless, Illinois State Geological Survey, 1957, 233 pp. Geology and Mineral Resources of the Carbondale Quadrangle, Bulletin 48, by J. E. Lamar, Illinois State Geological Survey, 1925, 172 pp. Geology and Mineral Resources of the Carlinville Quadrangle, Bulletin 77, by John R. Ball, Illinois State Geological Survey, 1952, 110 pp. Geology and Mineral Resources of the Dixon Quadrangle, Bulletin 49, Russell Stafford Knappen, Illinois State Geological Survey, 1926, 141 pp. Geology and Mineral Resources of the Edgington and Milan Quadrangles, Bulletin 38C, by T. E. Savage and J. A. Udden, Illinois State Geological Survey, 96 pp. Geology and Mineral Resources of the Equality-Shawneetown Area (Parts of Gallatin and Saline Counties ), Bulletin 47, by Charles Butts, Illinois State Geological Survey, 1925, 76 pp. Geology and Mineral Resources of The Hardin and Brussels Quadrangles (in Illinois ), U.S. Geological Survey Professional Paper 218, by W. W. Rubey, 1952, afb, 179 pp. Geology and Mineral Resources of the Herscher Quadrangle, Bulletin 55, by L. F. Athy, Illinois State Geological Survey, 1928, 120 pp. Geology and Mineral Resources of the Hennepin and La Salle Quadrangles, Bulletin 37, by Gilbert H. Cady, Illinois State Geological Survey, 1919, 136 pp. The Geology and Mineral Resources of the Joliet Quadrangle, Bulletin 51, by D. J. Fisher, Illinois State Geological Survey, 1925, 160 pp. "Geology and Mineral Resources of the Marseilles, Ottawa, and Streator Quadrangles," by H. B. Willman and J. N. Payne, Illinois Geological Survey Bulletin 66, 1942. Geology and Minerals of the St. Louis Quadrangle in Missouri & Illinois, Bulletin 438, by N.M. Fenneman, U. S. Geological Survey, 1911. Geology and Paleontology, Vol. III, A. H. Worthen, Director, Geological Survey of Illinois, Western Engraving Company, Springfield, Illinois, 1868, 572 pp. Geology and Paleontology, Vol. VI, A. H. Worthen, Director, Geological Survey of Illinois, 1875, 532 pp. Geology and Paleontology of Late Pleistocene Lake Saline, Southeastern Illinois, Circular 471, by John C. Frye, A. Byron Leonard, H. B. Willman, and H. D. Glass, Illinois State Geological Survey, 1972, 44 pp. Geology and Petrology of the Anvil Rock Sandstone of Southern Illinois, Circular 256, by: M. E. Hopkins, Illinois State Geological Survey, 1958, 49 pp. Geology and Petrology of the Trivoli Sandstone in the Illinois Basin, Circular 316, by Marvin J. Andresen, Illinois State Geological Survey, 1961, 31 pp. Geology for a New Generation, Illinois State Geological Survey Annual Report, 1998, 58 pp. Geology for Planning in Boone and Winnebago Counties, Circular 538, by Richard C. Berg, Johnpp. Kempton, and Amy N. Stecyk with contributions by Jonathan H. Goodwin, Randall E. Hughes, John M. Masters, and Christopher J. Stohr, Illinois State Geological Survey, 1984, 69 pp. Geology Foundation for the New Century, Illinois State Geological Survey Annual Report, 1999, 76 pp. Geology of Buda Quadrangle, Illinois, Circular 275, by Paul MacClintock, and H. B. Willman, Illinois State Geological Survey, 1959, 29 pp. Geology of Carbonate Aggregate Resources of Illinois, Illinois Mineral Notes 87, by Jonathan H. Goodwin, Illinois State Geological Survey, 1983, 12 pp. Geology of Freeport Quadrangle, Illinois, Circular 395, by F. L. Doyle, Illinois State Geological Survey, 1965, 24 pp. Geology of Hardin County and the Adjoining Part of Pope County, Bulletin 41, by Stuart Weller, with the collaboration of Charles Butts, L. W. Currier, and R. D. Salisbury, Illinois State Geological Survey, 1920, 416 pp. Geology of the Bloomfield Quadrangle, Johnson County, Illinois, Bulletin 99, by W. John Nelson, Illinois State Geological Survey, 1993, 30 pp. Geology of the Chicago Region, Bulletin 65, by J Harlen Bretz, Illinois State Geological Survey, 1939-55, 3 vols., Part I. General. 1939, 118 pp. Geology of the Eddyville, Stonefort, and Creal Springs Quadrangles, Southern Illinois, Bulletin 96, by W. John Nelson, Joseph A. Devera, Russell J. Jacobson, Donald K. Lumm, Russell A. Peppers, Brian Trask, C. Pius Weibel, Leon R. Follmer, Matthew H. Riggs, Stevenpp. Esling, Elizabeth D. Henderson, and Mary S. Lannon, Illinois State Geological Survey, 1991, 85 pp. 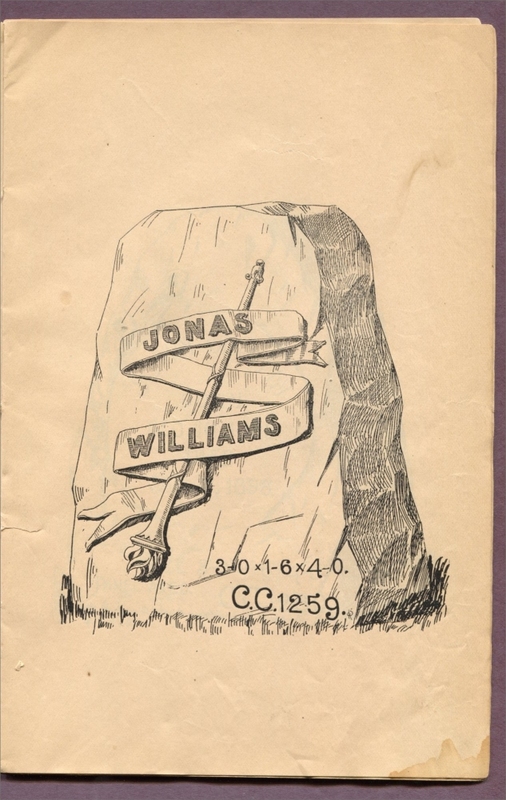 Geology of the Goreville Quadrangle, Johnson and Williamson Counties, Illinois, Bulletin 97, Russell J. Jacobson; contributions by Stevenpp. Esling, Thomas A. Leonard, and Leon R. Follmer, Illinois State Geological Survey, 1992, 32 pp. Geology of the Jonesboro 15-Minute Quadrangle, Southwestern Illinois - Jonesboro, Mill Creek, Ware, and McClure 7.5-Minute Quadrangles, Bulletin 101, W. John Nelson, Joseph A. Devera, and John M. Masters, Illinois State Geological Survey, 1996, 57 pp. Geology of the Lick Creek Quadrangle, Johnson, Union, and Williamson Counties, Southern Illinois, Bulletin 103, by W. John Nelson and C. Pius Weibel, Illinois State Geological Survey, 1996, 39 pp. Geography of the Middle Illinois Valley, Bulletin 15, by Harlan H. Barrows, Illinois State Geological Survey, 1910, Reprinted 1925, 128 pp. Geology of the Pomona Quadrangle, Illinois, Circular 320, George A. Desborough, Illinois State Geological Survey, 1961, 16 pp. Geography of the Upper Illinois Valley and History of Development, Bulletin 27, by Carl Ortwin Sauer, Illinois State Geological Survey, 1916, 208 pp. Geology of the Waltersburg Quadrangle, Pope County, Illinois, Bulletin 98, by C. Pius Weibel, W. John Nelson, Lynne B. Oliver, and Stevenpp. Esling, Illinois State Geological Survey, 1993, 41 pp. Geology of Western Illinois, Guidebook 14, by Janis D. Treworgy, E. Donald McKay, Jerry T. Wickham. 1979, (43rd Annual Tri-State Geological Field Conference, October 5-7, Pere Marquette State Park, Grafton, Illinois.) 90 pp. Grand Tower Limestone (Devonian) of Southern Illinois, Circular 389, Wayne F. Meents and David H. Swann, Illinois State Geological Survey, 1965, 34 pp. Guide to Rocks and Minerals of Illinois, by Wayne Frankie, Geoscience Education Series 16, Illinois State Geological Survey, 2004, 69 pp. Guide to Rocks and Minerals of Illinois, Educational Series 5, by J. C. Frye, Illinois State Geological Survey, Urbana: 1960, 40 pp. Guide to The Geological Map of Illinois, Educational Series 7, by J. C. Frye, Illinois State Geological Survey, Urbana: 1961, 24 pp. Guide to The Geology of Garden of the Gods Area, Gallatin, Hardin, Pope, and Saline Counties, Illinois, by Wayne T. Frankie and Russell J. Jacobsen, ISGS Field Trip Guidebook 2001–A/B, Illinois State Geological Survey, Champaign, IL 2001. Guide to The Geology of The Hardin Area, Calhoun and Greene Counties, ISGS Field Trip Guidebook 1994B, by D. L. Reinertsen, et al., Illinois State Geological Survey, Champaign: 1994, 57 pp. Guide to The Geology of the Joliet Area, Including the Midewin National Tallgrass Prairie and the Des Plaines and Mazonia/Braidwood State Fish and Wildlife Areas, Will and Portions of Grundy and Kankakee Counties, Illinois, FT 2003-A, W. T. Frankie and R. S. Nelson, Geological Survey of Illinois, 2003, 100 pp. A Guidebook to Mining In America: Volume 2: East (Minnesota, Iowa, Missouri, Arkansas, Louisiana, and farther East), by John R. Park, Stonerose Publishing Co., Miami, Florida, April, 2000," available at Stonerose Publishing Company. Handbook on Limestone and Dolomite For Illinois Quarry Operators, by John Everts Lamar, Urbana, Illinois State Geological Survey, 1967. Series: Illinois State Geological Survey Bulletin 91. Handbook of Illinois Stratigraphy, Bulletin 95, by H. B. Willman, Elwood Atherton, T. C. Buschbach, Charles Collinson, J. C. Frye, M. E. Hopkins, J. A. Lineback, and J. A. Simon, Illinois State Geological Survey, 1975, 261 pp. High-Calcium Limestone near Morris, Illinois, Report of Investigation 23., J. E. Lamar and H. B. Willman, Illinois State Geological Survey, 1931, 26 pp. "High-Purity Dolomite in Illinois," by H. B. Willman, State of Illinois Department of Registration and Education, Division of the State Geological Survey, Report of Investigations 90, 1943, 101 pp., 76 figs. High-Purity Limestones in Illinois, Illinois Mineral Notes 27, by J. E. Lamar, Illinois State Geological Survey, 1966, 20 pp. Historical Encyclopedia of Illinois, edited by Newton Bateman, LL.D. and Paul Selby, A.M. and History of Kane County, Edited by Gen. John S. Wilcox, Chicago: Munsell Publishing Company, 1904, pp. 699-702. History of Illinois, by L. E. Robinson and Irving Moore, New York: American Book Company, 1909, 288 pp. History of Illinois Mineral Industries, Educational Series 10, by H. E. Risser and R. L. Major, Illinois State Geological Survey, 1968, 30 pp. The History of Will County, Illinois, by William Le Baron, Chicago: William Le Baron, Jr. & Co., 1878. History of Will County, Illinois, by August Maue, Topeka: Historical Publishing Co., 1928. Igneous Intrusive Rocks in Illinois and Their Economic Significance, Report Investigation 197, by K. E. Clegg and J. C. Bradbury, Illinois State Geological Survey, Urbana: 1956, 19 pp. Illinois 1962 Mineral Production by Counties, Mineral Economics Brief 7, by W. L. Busch, Illinois State Geological Survey, 1964, 8 pp. Illinois 1963 Mineral Production by Counties, Mineral Economics Brief 9, by W. L. Busch, Illinois State Geological Survey, 1965, 8 pp. Illinois 1964 Mineral Production by Counties, Mineral Economics Brief 10, by W. L. Busch, Illinois State Geological Survey, 1965, 8 pp. Illinois and Michigan Canal: A Contemporary Perspective in Essays and Photographs, by Jim Redd, Southern Illinois University Press, 1993, 112 pp. Illinois Building Stones, Report Investigation 184, by J. E. Lamar and H. B. Willman, publisher: Urbana, 1955. Illinois Geology: Science for Society, Illinois State Geological Survey Annual Report 2002, 136 pp. Illinois Geological Survey Annual Report 2001-2002, Illinois State Geological Survey. Illinois Mineral Industry in 1932 --A Preliminary Statistical Summary and Economic Review, Report of Investigation 28, W. H. Voskuil and Alma R. Sweeny, Illinois State Geological Survey, 1933, 66 pp. Illinois Mineral Industry in 1933 - A Preliminary Statistical Summary and Economic Review, Report of Investigation 36, W. H. Voskuil and Alma R. Sweeny, Illinois State Geological Survey, 1934, 69 pp., 3 figs. Illinois Mineral Industry in 1935: A Preliminary Statistical and Economic Review, Report of Investigation 43, Walter H. Voskuil, Alma R. Sweeny, and W. A. Newton, Illinois State Geological Survey, 1936, 62 pp., 8 figs., 41 tables. Illinois Mineral Industry in 1936: A Preliminary Statistical Summary and Economic Review, Report of Investigation 46, Walter H. Voskuil, Alma R. Sweeny, and W. A. Newton, Illinois State Geological Survey, 1937, 65 pp., 9 figs., 53 tables. Illinois Mineral Industry in 1937, Report of Investigation 51, A Preliminary Statistical Summary and Economic Review: Walter H. Voskuil, Alma R. Sweeny, and G. N. Oliver, Illinois State Geological Survey, 1938, 51 pp., 1 fig. Illinois Mineral Industry in 1938: A Preliminary Statistical Summary and Economic Review, Report of Investigation 56, Walter H. Voskuil and G. N. Oliver, Illinois State Geological Survey, 1939, 24 pp., 3 figs. Illinois Mineral Industry in 1939, with Special Discussion of the Distribution of Coal in 1937, Report of Investigation 63, Walter H. Voskuil and G. N. Oliver, Illinois State Geological Survey, 1940, 57 pp., 9 figs., 45 tables. “Illinois Mineral Industry in 1940” (Part I), and “ Historical Summary, 1919-1939” (Part II), in Report of Investigation 74, Walter H. Voskuil and G. N. Oliver, Illinois State Geological Survey, 1941, 93 pp., 6 figs. Illinois Mineral Industry in 1941, Report of Investigation 87, Walter H. Voskuil, Douglas F. Stevens, and G. N. Oliver, Illinois State Geological Survey, 1943, 87 pp., 12 figs., 50 tables. Illinois Mineral Industry in 1942, Report of Investigation 94, Walter H. Voskuil and Douglas F. Stevens, Illinois State Geological Survey, 1944, 83 pp., 10 figs., 47 tables. Illinois Mineral Industry in 1943, Report of Investigation 101, Walter H. Voskuil and Douglas F. Stevens, Illinois State Geological Survey, 1944, 89 pp., 12 figs., 65 tables. Illinois Mineral Industry in 1944, Report of Investigation 109, Walter H. Voskuil and Douglas F. Stevens, Illinois State Geological Survey, 1945, 90 pp., 14 figs., 70 tables. Illinois Mineral Industry in 1945, Report of Investigation 121, Walter H. Voskuil, Douglas F. Stevens, and Nina T. Hamrick, Illinois State Geological Survey, 1946, 116 pp., 22 figs., 84 tables. Illinois Mineral Industry in 1946, Report of Investigation 127, Walter H. Voskuil, Illinois State Geological Survey, 1948, 123 pp., 21 figs., 85 tables. Illinois Mineral Industry in 1947, Report of Investigation 140, Walter H. Voskuil, Illinois State Geological Survey, 1949, 91 pp., 19 figs., 66 tables. Illinois Mineral Industry in 1948, Report of Investigation 147,by Walter H. Voskuil, Illinois State Geological Survey, 1950, 73 pp., 16 figs., 52 tables. Illinois Mineral Industry in 1949, Report of Investigation 150,by Walter H. Voskuil, Illinois State Geological Survey, 1951, 63 pp., 14 figs., 50 tables. Illinois Mineral Industry in 1950, Report of Investigation 158,by Walter H. Voskuil, Illinois State Geological Survey, 1952, 58 pp. Illinois Mineral Industry in 1951 and 1952, Report of Investigation 168, Walter H. Voskuil, Illinois State Geological Survey, 1953, 52 pp. Illinois Mineral Industry in 1953, Report of Investigation 177, Walter H. Voskuil, Illinois State Geological Survey, 1955, 42 pp. Illinois Mineral Industry in 1972 and Review of Preliminary Mineral Production Data for 1973, Illinois Mineral Notes 58, by Ramesh Malhotra, Illinois State Geological Survey, 1974, 54 pp. Illinois Mineral Industry in 1973 and Review of Preliminary Mineral Production Data for 1974, Illinois Mineral Notes 62, by Ramesh Malhotra, Illinois State Geological Survey, 1975, 48 pp. Illinois Mineral Industry in 1974, Illinois Mineral Notes 66, by Ramesh Malhotra and Shirley Hallaron, Illinois State Geological Survey, 1977, 40 pp. Illinois Mineral Industry in 1975 and Review of Preliminary Mineral Production Data for 1976, Illinois Mineral Notes 68, by Irma Samson and Amy Dingwell, Illinois State Geological Survey, 1977, 39 pp. Illinois Mineral Industry in 1976 and Review of Preliminary Mineral Production Data for 1977, Illinois Mineral Notes 70, by Irma Samson and Amy G. Dingwell, Illinois State Geological Survey, 1979, 38 pp. Illinois Mineral Industry in 1977 and Review of Preliminary Mineral Production Data for 1978, Illinois Mineral Notes 75, by Irma Samson, Illinois State Geological Survey, 1980, 36 pp. Illinois Mineral Industry in 1978 and Review of Preliminary Mineral Production Data for 1979, Illinois Mineral Notes 79, by Irma Samson, Illinois State Geological Survey, 1981, 35 pp. Illinois Mineral Industry in 1979/1980 and Review of Preliminary Mineral Production Data for 1981, Illinois Mineral Notes 86, by Irma Samson, Illinois State Geological Survey, 1983, 40 pp. Illinois Mineral Industry in 1981-83 and Review of Preliminary Mineral Production Data for 1984, Illinois Mineral Notes 93, by Irma E. Samson and Subhash Bhagwat, Illinois State Geological Survey, 1985, 38 pp. Illinois Mineral Industry in 1984 and Review of Preliminary Mineral Production Data for 1985, Illinois Mineral Notes 95, by Irma E. Samson and Subhash B. Bhagwat, Illinois State Geological Survey, 1986, 44 pp. Illinois Mineral Industry in 1985 and Review of Preliminary Mineral Production Data for 1986, Illinois Mineral Notes 99, by Irma E. Samson, Illinois State Geological Survey, 1988, 45 pp. Illinois Mineral Industry in 1986 and Review of Mineral Production Data for 1987, Illinois Mineral Notes 100, by Irma E. Samson, Illinois State Geological Survey, 1989, 40 pp. Illinois Mineral Industry in 1987 and Review of Preliminary Mineral Production Data for 1988, Illinois Mineral Notes 101, by Irma E. Samson and Subhash B. Bhagwat. 1989. ], Illinois State Geological Survey, 1989, 43 pp. Illinois Mineral Industry in 1988 and Review of Preliminary Mineral Production Data for 1989, Illinois Minerals 105, by Irma E. Samson and Subhash B. Bhagwat, Illinois State Geological Survey, 1990, 43 pp. Illinois Mineral Industry in 1989 and Review of Preliminary Mineral Production Data for 1990, Illinois Minerals 108, by Irma E. Samson, Illinois State Geological Survey, 1991, 43 pp. Illinois Mineral Industry in 1990 and Review of Preliminary Mineral Production Data for 1991, Illinois Minerals 110, by Irma E. Samson, Illinois State Geological Survey, 1994, 1992, 43 pp. Illinois Mineral Industry in 1991 and Review of Preliminary Mineral Production Data for 1992, Illinois Minerals 111,by Irma E. Samson, Illinois State Geological Survey, 1994, 42 pp. Illinois Mineral Industry in 1992 and Review of Preliminary Mineral Production Data for 1993, Illinois Minerals 112, by Irma E. Samson, Illinois State Geological Survey, 1994, 43 pp. Illinois Mineral Industry 1993-1996 and a Report on Water Resources of Illinois, Illinois Minerals 119, by Viju C. Ipe, Illinois State Geological Survey, 2000, 41 pp. Illinois Mineral Industry 1996-1998, Open File Series 2003-10, by Viju C. Ipe and Subhash B. Bhagwat, Illinois State Geological Survey, 2003, 25 pp. Illinois Mineral Industry 1996-1998, Open File Series 2003-10, by Viju C. Ipe and Subhash B. Bhagwat, Illinois Geological Survey, 29 pp. (Includes sections on: Mineral Industry in 1998, Stone, Cement, Lime, Figure 1. Mineral Production and Mineral Processing Plants, Figure 2. Relative Value of Mineral Extracted, Processed, and Manufactured, 1998, Figure 18. Illinois Districts and Counties Producing Stone, 1998, Table 1. Production and Value of Mineral Extracted, Processed, and Manufactured into Products in Illinois, 1996-1998, Table 2. Production of Minerals in Illinois Compared with U. S. Mineral Production, 1996-1998, Table 3. Employment and Wages in the Illinois Mineral Industry, 1996-1998. Illinois Mineral Production by Counties, Mineral Economics Brief 21, by W. L. Busch, Illinois State Geological Survey, 1968, 11 pp. Illinois Mineral Production by Counties, 1965, Mineral Economics Brief 16, by W. L. Busch, Illinois State Geological Survey, 1967, 10 pp. Illinois Mineral Production by Counties, 1967, Mineral Economics Brief 24, by W. L. Busch, Illinois State Geological Survey, 1969, 11 pp. Illinois Mineral Production by Counties, 1968, Mineral Economics Brief 27, by W. L. Busch, Illinois State Geological Survey, 1970, 12 pp. Illinois Mineral Production by Counties, 1969, Mineral Economics Brief 28, by W. L. Busch, Illinois State Geological Survey, 1969, 13 pp. Illinois Mineral Production by Counties, 1970, Illinois Mineral Notes 48, by W. L. Busch, Illinois State Geological Survey, 1972, 14 pp. Illinois Mineral Production by Counties, 1971, Illinois Mineral Notes 51, by W. L. Busch, Illinois State Geological Survey, 1973, 15 pp. Illinois ' Mineral Resources, Mapped by Geological Survey, Important in War, Circular 87, by M. M. Leighton, 1942. (Reprinted from the Blue Book of the State of Illinois, 1941-1942,pp. 448-461, 1942. ), Illinois State Geological Survey, 14 pp. Illinois-Missouri Mineral Resource Complex - A Base for Industrial Development, Circular 337, by Hubert E. Risser, Illinois State Geological Survey, 1962, 60 pp. Illinois Natural Resources - An Industrial Development Asset, Illinois Mineral Notes 21, by Hubert E. Risser, Illinois State Geological Survey, 1964, 5 pp. The Illinois State Geological Survey, 1997, New Directions, 53 pp. Illinois Stone Production in 1959, Illinois Mineral Notes 14, by W. L. Busch. 1961, Illinois State Geological Survey, 4 pp. Illinois Stone Production in 1960, Mineral Economics Brief 2, by W. L. Busch, Illinois State Geological Survey, 1961, 5 pp. 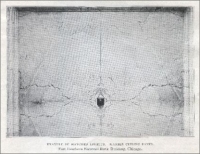 Illinois Surface Topography (Map), Donald E. Luman, Lisa R. Smith and Christopher C. Goldsmith. 2003. Scale, 1:500,000. Size, 36 x 54 inches. Impact Resistance of Illinois Limestones and Dolomites, Circular 345, by Richard D. Harvey, Illinois State Geological Survey, 1963, 20 pp. Industrial Minerals and Metals of Illinois, Educational Series 8, by J. E. Lamar, Illinois State Geological Survey, Urbana: 1965. Industrial Minerals and Metals Publications of the Illinois State Geological Survey through December 1989, Illinois Minerals 104, by compiled by Jonathan H. Goodwin, Donald G. Mikulic, and James W. Baxter, Illinois State Geological Survey, 1990, 33 pp. Industrial Minerals in Illinois: A Key to Growth, by Dr. Subhash Bhagwat, Mineral Economist, Illinois State Geological Survey, 4 pp. This publication is available on the Illinois State Geological Survey web site. Industrial Minerals Produced in Illinois in 1943: Clays and Clay Products, Fluorspar, Sand, Gravel, Silica Sand, Ground Silica, Tripoli, Stone, Cement, Lime, Mineral Wool; and Agstone Used in Illinois in 1943--Preliminary Report, Circular 111, by Walter H. Voskuil and Douglas F. Stevens, Illinois State Geological Survey, 1944, 31 pp. Industrial Minerals Publications of the Illinois State Geological Survey through December 1978, Illinois Mineral Notes 69, by J. E. Lamar and J. C. Bradbury, Illinois State Geological Survey, 1979, 13 pp. Inside Illinois Mineral Resources, Educational Series 9, by J. C. Frye, Illinois State Geological Survey, Urbana: 1967, 31 pp. “Interior Marble Decoration,” The Monumental News, August 1895, pp. 482-485. Intrusive Breccias at Hicks Dome, Hardin County, Illinois, Circular 550, by J. C. Bradbury and J. W. Baxter, Illinois State Geological Survey, 1992, 23 pp. Karst Regions of Illinois, Open File Series 1997-2, S. V. Panno, C.pp. Weibel, and W. Li, Illinois State Geological Survey, 1997, 42 pp. Lake Michigan Bibliography: 1860-1988, Geological and Physical Processes, Open File Series 1989-1, Nancy Peterson Holm and Beth McArdle Morgan, Illinois State Geological Survey, December 1988, 443 pp. Lake Michigan Bibliography: Geological and Physical Processes Update, Open File Series 1989-5,Beth McArdle Morgan and Nancy Peterson Holm, Illinois State Geological Survey, December 1989, 116 pp. Land Surface Topography Map, Jo Daviess County, Illinois, Open File Series m 2000-8a, by Matthew H. Riggs, Scott Medlin and Christopher S. McGarry, Illinois State Geological Survey, 2000, Scale, 1:62,500, 29 x 41 inches. Landforms of Illinois (Map). 1980 edition. Scale, 1:1,000,000 or approximately 1 inch = 16 miles. Size, 17 x 27 inches. Black-line sketching shows principal relief features, county lines, and principal towns. Late Mississippian Sandstones of Illinois, Circular 340, bypp. E. Potter, Illinois State Geological Survey, 1962, 36 pp. Lemont History and Anecdotes, Sonia Kallick and Thomas Ludwig, Lemont: School District 113, 1978. Lightweight Aggregate from Illinois Shales, Circular 290, by W. Arthur White, Illinois State Geological Survey, 1960, 29 pp. The Lime and Limestone Market for Sulfur Removal: Potential for 1992, Illinois Mineral Notes 90, by Subhash B. Bhagwat, Illinois State Geological Survey, 1985, 13 pp. Limestone and Dolomite Resources of Jersey County, Illinois, Circular 448, by James W. Baxter, Illinois State Geological Survey, 1970, 26 pp. Limestone Resources of Adams and Brown Counties, Illinois, Circular 512, by Jonathan H. Goodwin and Richard D. Harvey, Illinois State Geological Survey, 1980, 20 pp. 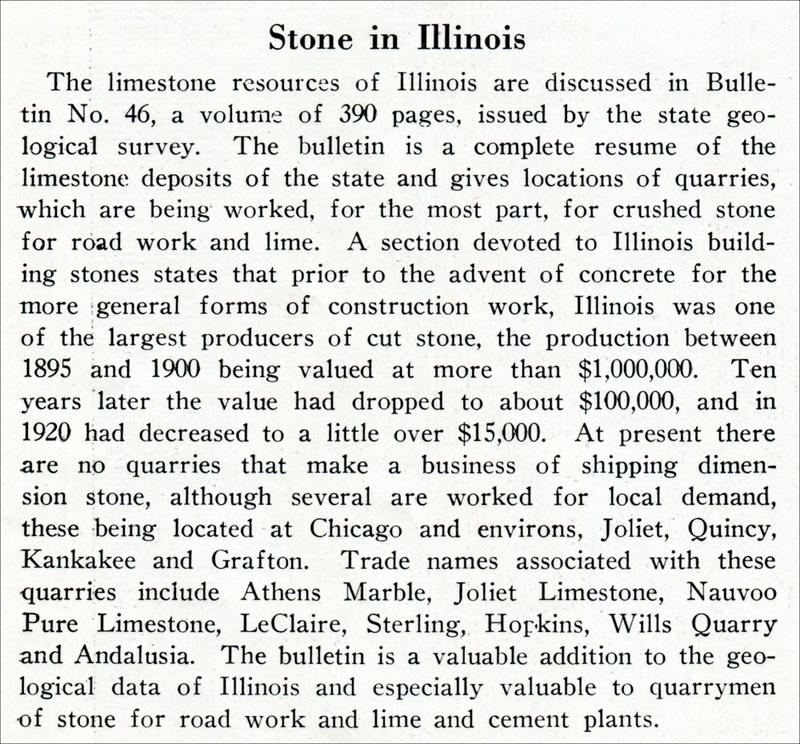 Limestone Resources of Illinois, Bulletin 46, by Frank Krey and J. E. Lamar, Illinois State Geological Survey, 1925, 392 pp. Limestone Resources of Jefferson and Marion Counties, Illinois, Illinois Mineral Notes 23, by James C. Bradbury, Illinois State Geological Survey, 1965, 15 pp. Limestone Resources of Madison County, Illinois, Circular 390, by James W. Baxter, Illinois State Geological Survey, 1965, 39 pp. Limestone Resources of Scott County, Illinois, Circular 472, by James W. Baxter, Illinois State Geological Survey, 1972, 24 pp. Limestone Resources of the Lower Kaskaskia Valley, Circular 346, by James C. Bradbury, Illinois State Geological Survey, 1963, 22 pp. The Limestone Resources of the Pontiac-Fairbury Region, Report of Investigation 17, J. E. Lamar, Illinois State Geological Survey, 1929, 27 pp., 7 figs. List of Publications, Bulletin 32, Illinois State Geological Survey, 1974, 87 pp. List of Publications on Illinois Geology, Mineral Resources, and Mineral Industries, Illinois State Geological Survey, 1954. Map and Directory of Illinois Mineral Industries (Map). 1930, Scale, 1:500,000 or approximately 1 inch = 8 miles. Size, 31 x 52 inches. Shows locations of oil and gas fields, boundary pits, quarries giving names and addresses of operators named on the map. Directory is arranged alphabetically by industry and by county. Map Showing Thickness of Quaternary Deposits, Jo Daviess County, Illinois (Map), Open File Series m 2000-8c, Matthew H. Riggs and Christopher S. McGarry, Illinois State Geological Survey, 2000. Scale, 1:62,500, 29 x 41 inches, Computer-generated map. Martin B. Madden, Public Servant, Edgar Weston Brent, Chicago: Edgar Weston Brent, 1901. Mineral Industries of Illinois (Map). 1961 edition, Scale, 1:500,000 or approximately 1 inch = 8 miles. Size, 30 x 51 inches. Shows areas underlain by coal beds and associated formations, limestone or dolomite, chert and tripoli, and Cretaceous-Tertiary clays; mining districts of fluorspar, and lead and zinc; producing oil and gas pools; coal mines; stone quarries; sand and gravel pits; and industrial plants processing or principally using natural mineral resources. The Mineral Production of Illinois in 1906, Original Circular 2, by F. B. Van Horn. 1907, 11 pp. The Mineral Production of Illinois in 1907, Original Circular 4, by F. B. Van Horn. 1908, 11 pp. The Mineral Production of Illinois in 1908, Original Circular 5, by Raymond S. Blatchley, Illinois State Geological Survey, 1909, 20 pp. Mineral Production in Illinois in 1954, Circular 206, by W. H. Voskuil and W. L. Busch, Illinois State Geological Survey, 1955, 59 pp. Mineral Production in Illinois in 1955, Circular 218, by W. H. Voskuil and W. L. Busch, 1956, 40 pp. Mineral Production in Illinois in 1956, Circular 238, by W. L. Busch and W. H. Voskuil, Illinois State Geological Survey, 1957, 36 pp. Mineral Production in Illinois in 1957, Circular 257, W. L. Busch, Illinois State Geological Survey, 1958, 39 pp. Mineral Production in Illinois in 1958, Circular 279, W. L. Busch, Illinois State Geological Survey, 1959, 43 pp. Mineral Production in Illinois in 1959, Circular 300, by W. L. Busch, Illinois State Geological Survey, 1960, 36 pp. Mineral Production in Illinois in 1960, Circular 327, by W. L. Busch, Illinois State Geological Survey, 1962, 34 pp. Mineral Production in Illinois in l961, Circular 341, by W. L. Busch, Illinois State Geological Survey, 1962, 39 pp. Mineral Production in Illinois in 1962, Circular 357, by W. L. Busch, Illinois State Geological Survey, 1963, 44 pp. Mineral Production in Illinois in 1963, Circular 373, by W. L. Busch, Illinois State Geological Survey, 1964, 20 pp. Mineral Production in Illinois in 1964, Circular 392, by W. L. Busch, Illinois State Geological Survey, 1965, 20 pp. Mineral Production in Illinois in 1965 and Summary of Illinois Mineral Production by Commodities, 1941-1965, Circular 407, by W. L. Busch, Illinois State Geological Survey, 1966, 27 pp. Mineral Production in Illinois in 1966, Circular 418, by W. L. Busch, Illinois State Geological Survey, 1968, 23 pp. Mineral Production in Illinois in 1967, Circular 435, by W. L. Busch, Illinois State Geological Survey, 1968, 22 pp. Mineral Production in Illinois in 1968, Circular 447, by W. L. Busch, Illinois State Geological Survey, 1969, 21 pp. Mineral Production in Illinois in 1969, Circular 455, by W. L. Busch. 1971, Illinois State Geological Survey, 22 pp. Mineral Production in Illinois in 1970, Circular 469, W. L. Busch, Illinois State Geological Survey, 1972, 22 pp. Mineral Production in Illinois in 1971 and Summary of Illinois Mineral Production by Commodities, 1941-1970, Circular 477, by W. L. Busch, Illinois State Geological Survey, 1973, 28 pp. Mineral Resources and Mineral Industries of the East-Central Illinois Region, Mineral Economics Brief 15, by W. L. Busch, Illinois State Geological Survey, 1967, 39 pp. Mineral Resources and Mineral Industries of the East St. Louis Region, Illinois, Mineral Economics Brief 12, by Robert L. Major, Illinois State Geological Survey, 1966, 32 pp. Mineral Resources and Mineral Industries of the Extreme Southern Illinois Region, Mineral Economics Brief 13, by Robert L. Major, Illinois State Geological Survey, 1966, 26 pp. Mineral Resources and Mineral Industries of the Northwestern Illinois Region, Mineral Economics Brief 20, by Robert L. Major, Illinois State Geological Survey, 1967, 25 pp. Mineral Resources and Mineral Industries of the Northeastern Illinois Region, Mineral Economics Brief 22, by Robert L. Major, Illinois State Geological Survey, 1968, 28 pp. Mineral Resources and Mineral Industries of the Southeastern Illinois Region, Mineral Economics Brief 14, by W. L. Busch, Illinois State Geological Survey, 1966, 36 pp. Mineral Resources and Mineral Industries of the Springfield Region, Illinois, Mineral Economics Brief 17, by Robert L. Major, Illinois State Geological Survey, 1967, 35 pp. Mineral Resources and Mineral Industries of the Western Illinois Region, Mineral Economics Brief 19, by Robert L. Major, Illinois State Geological Survey, 1967, 24 pp. Mineral Resources of The Illinois – Kentucky Mining District. United States Geological Survey Professional Paper 970, United States Geological Survey, 1976, 15 pp. Mineralogy and Diagenesis of the Pennsylvanian Browning Sandstone on the Western Shelf of the Illinois Basin, Circular 561, by Duane M. Moore, Illinois State Geological Survey, 2003, 13 pp. Mines and Minerals in Illinois: An Industrial Romance, Chicago: Blakely-Oswald Printing, 1945?, 96 pp. The Mississippi Valley Between Savanna and Davenport, Bulletin 13, by J. Ernest Carman, Illinois State Geological Survey, 1909, 96 pp. Mississippian Limestone Resources in Fulton, McDonough, and Schuyler Counties, Illinois, Circular 370, by Richard D. Harvey, Illinois State Geological Survey, 1964, 27 pp. New Publications. Capsule Report: Subsurface Dolomite in Lake, McHenry, and Part of Northwestern Cook Counties, Illinois Mineral Notes 4, Meredith E. Ostrom, Illinois State Geological Survey, 1956, 7 pp. 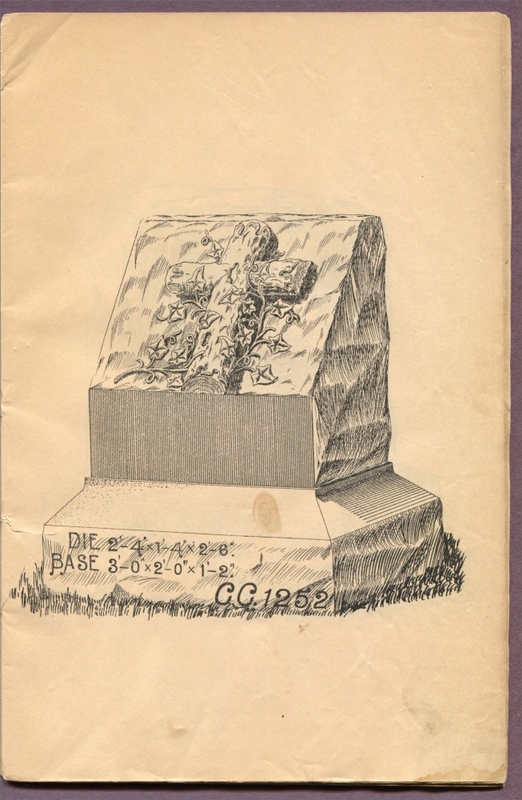 New Style Rock Work Cemetery Monumental Catalog, 1890s, Charles Clements, Wholesale Granite Dealer, 372-378 Boylston Street, Boston, Massachusetts – 36 La Salle Street, Chicago, Illinois − Quarry, West Quincy, Mass. – Foreign Office Aberdeen, Scotland. Niagaran Reef at Thornton, Illinois, by H. A. Lowenstam, Urbana: 1956, 19 pp. 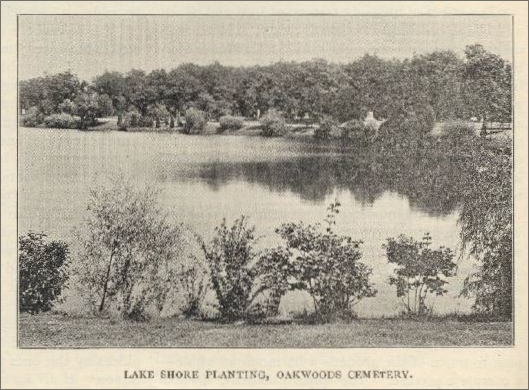 “Oakwoods Cemetery, Chicago” (Illinois), from The Monumental News, August 1894, pp. 383-385. Occurrence and Distribution of Minerals in Illinois Coals, Circular 476, by C. Prasada Rao and Harold J. Gluskoter, Illinois State Geological Survey, 1973, 56 pp. The Oolite of the Ste. Genevieve Formation, Report of Investigation 10, J. E. Lamar, Illinois State Geological Survey, 1926. (Reprinted from Transactions of the Illinois State Academy of Science, v. 18,pp. 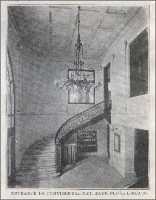 409-13, 1925.) 12 pp. “Our Building Stone Supply” (pdf) (Quarrying in the eastern United States circa 1887), from the Scientific American: A weekly journal of practical information, art, science, mechanics, chemistry, and manufactures, New York, Vol. LVI. No. 2 (new series), January 8, 1887. Papers on Industrial Minerals, Bulletin 68B, Presented on the Occasion of the Illinois Mineral Industries Conference, November 14-16, 1940, 57 pp. “The Parking Lot Cemetery” (located at the corner of Kirchoff and Plum Grove Roads in Rolling Meadows, Illinois), by Karen Kruse, in the Association For Gravestone Studies Quarterly, Vol. 32, No. 4, Fall 2008, pp. 8-9. Petrography and Origin of Illinois Nodular Cherts, Circular 245, by Donald L. Biggs, Illinois State Geological Survey, 1957, 25 pp. Petrology of Bethel Sandstone of South-Central Illinois, Report of Investigation 95, Willard D. Pye, Illinois State Geological Survey, 1944. (Reprinted from Bulletin of the American Association of Petroleum Geologists, v. 28, no. 1, pp. 63-122, 1944.) 60 pp., 6 figs. Physical Geography of the Evanston-Waukegan Region, Bulletin 7, by Wallace W. Atwood and James Walter Goldthwait, Illinois State Geological Survey, 1908. Reprinted 1925, 102 pp. Pleistocene Stratigraphy of Illinois, Bulletin 94, by H. B. Willman and J. C. Frye, Illinois State Geological Survey, 1970, 204 pp. Portland Cement Resources of Illinois, Bulletin 17, by A. V. Bleininger et al., Illinois State Geological Survey, Urbana: 1912, 121 pp. “Possibilities for Calcitic Limestone Underground in Kankakee and Iroquois Counties,” by James W. Baxter.Illinois in Review of Manuscripts, Illinois Mineral Notes 5, 1957, 9 pp. Possibilities of Production from Lime Formations Given the "Acid Test," Circular 107, by Frederick Squires, Illinois State Geological Survey, 1944 (Reprinted from Oil Weekly, June 5, 1944. ), 15 pp. Potential Dolomite Resources of Carroll County, Illinois (Map), Open File Series m 1997-13k,Christopher S. McGarry and David A. Grimley, Illinois State Geological Survey, 1997, Scale, 1:62,500, Size, 27 x 36 inches. Preliminary Map of Limestone Outcrops (Map), Compiled by J. E. Lamar and R. S. Shrode, 1950, Scale, 1:1,000,000 or approximately 1 inch = 16 miles. Shows areas where limestone deposits that are more than three feet thick are exposed and indicates the principal characteristics of the deposits. Computer plot. Preliminary Report on the Economic Mineral Resources of Calhoun County, Report of Investigation 8, J. E. Lamar, Illinois State Geological Survey, 1926, 21 pp. 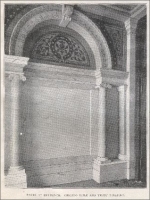 Preservation of an Historic Building Material: Joliet-Lemont Limestone, by James C. Bradbury, Deborah J. Slaton, Joseph LaRue, Donald G. Mikulic, and Vincent L. Michael, Chicago: Landmarks Preservation Council of Illinois, 1988. Proceedings of the 23rd Forum on the Geology of Industrial Minerals, Illinois Mineral Notes 102, by Randall E. Hughes and James C. Bradbury [eds. ], Illinois State Geological Survey, 1989, 105 pp. Properties of Carbonate Rocks Affecting Soundness of Aggregate --A Progress Report, Illinois Mineral Notes 54, by R. D. Harvey, G. S. Fraser, and J. W. Baxter, Illinois State Geological Survey, 1974, 20 pp. Quaternary deposits of Illinois (Map). Jerry A. Lineback. 1979. Scale, 1:500,000 or approximately 1 inch = 8 miles. Size, 40 x 56 inches. In color. Shows Quaternary deposits that lie at or near the land surface and loess thickness. Includes diagrammatic cross sections showing stratigraphic relationships of Wisconsinan and Illinoian units, a table of stratigraphic names, and three small maps showing bedrock geology, topography of the bedrock surface, and thickness of Pleistocene deposits. Quaternary Deposits of Illinois (Map). revised by Ardith K. Hansel and W. Hilton Johnson. 1996. Scale, approximately 1 inch = 40 miles. 8 1/2 x 11 inches. Recent Price and Cost Trends Relating to Stone, Sand, and Gravel Production in Illinois, Illinois Mineral Notes 10, by Hubert E. Risser, Illinois State Geological Survey, 1959, 4 pp. Report of the Canal Commissioners of the State of Illinois (1836-1917), Made to the Governor December 1, 1897, Springfield, Ill., Phillips Bros. State Printers, 1898. Results of Test-Drilling of Limestone near Morris, Illinois, Circular 4, by J. E. Lamar and H. B. Willman, Illinois State Geological Survey, 1933, 6 pp. Results of Test-Drilling of Limestone near Morris, Illinois: Supplement to Report of Investigation 23, J. E. Lamar and H. B. Willman, Illinois State Geological Survey, 1933, (ISGS Circular 4.) 6 pp. Revised Structure Map of the Taylorville Area, Supplement to Report of Investigation 1, A. H. Bell, Illinois State Geological Survey, 1929. 4 pp. Salem Limestone in Southwestern Illinois, Circular 284, by James W. Baxter, Illinois State Geological Survey, 1960, 32 pp. Sampling Limestone and Dolomite Deposits for Trace and Minor Elements, Circular 221, by J. E. Lamar and K. B. Thomson, Illinois State Geological Survey, 1956, 18 pp. Sandstone Resources of Extreme Southern Illinois - A Preliminary Report, Report of Investigation 188, D. L. Biggs and J. E. Lamar, Illinois State Geological Survey, 1955, 21 pp. Selected and Annotated List of Industrial Minerals Publications of the Illinois State Geological Survey, Illinois Mineral Notes 47, by compiled by J. E. Lamar, Illinois State Geological Survey, 1972, 24 pp. Sequence Stratigraphy of the Lower Chesterian (Mississippian) Strata of the Illinois Basin, Bulletin 107, by W. John Nelson, Langhorne B. Smith, Janis D. Treworgy, contributions by Lloyd C. Furer and Brian D. Keith, 2002, 70 pp. Shaded Relief of Carroll County, Illinois (Map), Open File Series m 1997-13f, Christopher S. McGarry, Illinois State Geological Survey, 1997, Scale, 1:62,500, Size, 27 x 36 inches. Shales as Source Material for Synthetic Lightweight Aggregate: Illinois Mineral Notes 9, W. A. White. New Data on a White-Burning Kaolin Clay from Pike County; Clay Resources of La Salle County, Illinois State Geological Survey, 1959, 5 pp. Shipments of Illinois Crushed Stone, Mineral Economics Brief 11, by W. L. Busch, Illinois State Geological Survey, 1966, 15 pp. Siliceous Materials of Extreme Southern Illinois--Silica, Novaculite, Ganister, Calico Rock, and Chert Gravels, Report of Investigation 166, by J. E. Lamar, Illinois State Geological Survey, 1953, 39 pp. Silurian Dolomite Isopach in Will and Southern Cook Counties, Illinois (Map), Open File Series m 1995-13f, compiled by Edward C. Smith and Melisa M. McLean, Illinois State Geological Survey, 1995. Scale, 1:100,000, Size, 34 x 27 inches. These videos are available through the Landmarks Preservation Council of Illinois. Southern Illinois Novaculite and Novaculite Gravel for Making Silica Refractories, Report of Investigation 117, C. W. Parmelee and C. G. Harman, Illinois State Geological Survey, 1946, 55 pp., 29 figs., 16 tables. State of Illinois Geological Survey (Annual Report), Original Circular 3, by H. Foster Bain, 1908, 2 pp. "The Stone Industry in the Vicinity of Chicago, Illinois," by W. C. Alden, in United States Geological Survey Bulletin 213, United States Geological Survey, Washington, D. C., Government Printing Office, 1903, pp. 357-360. Stones for Building and Decoration, by Georgepp. Merrill, 2nd ed., New York: John Wiley & Sons, 1897. Structural Features in Illinois, Bulletin 100, by W. John Nelson, Illinois State Geological Survey, 1995, 144 pp. Structural History of the Centralia Area, Report Investigation 172, by R. L. Brownfield, Illinois State Geological Survey, Urbana: 1954, 31 pp. Structure of Parts of Northeastern Williamson and Western Saline Counties, Report of Investigation 2, Gilbert H. Cady, Illinois State Geological Survey, 1925, 20 pp. Studies of the Chester Series in the Illinois Basin: 1943, Circular 91, (Reprinted from Transactions of the Illinois State Academy of Science, v. 35, no. 2, December 1942. ), Illinois State Geological Survey, 12 pp. Subsurface Dolomite and Limestone Resources of Grundy and Kendall Counties, Circular 230, by Meredith E. Ostrom, Illinois State Geological Survey, 1957, 25 pp. Subsurface Stratigraphy of the Kinderhook Series in Illinois, Report of Investigation 189, L. E. Workman and Tracey Gillette, Illinois State Geological Survey, 1956, 46 pp. Subsurface Structure of the Base of the Kinderhook-New Albany Shale in Central and Southern Illinois, Report of Investigation 92, Alfred H. Bell, Illinois State Geological Survey, 1943, 13 pp., 1 pl., 3 figs. Subsurface Variation in the High-Calcium Dolbee Creek Limestone in Western Illinois, Illinois Mineral Notes 78, by Mark Cloos and James Baxter, Illinois State Geological Survey, 1981, 23 pp. Summary of Illinois Mineral Industry, 1951-1959, Illinois Mineral Notes 13, by W. L. Busch, Illinois State Geological Survey, 1961, 4 pp. Summary of Illinois Mineral Production by Commodities, 1941-1960, Mineral Economics Brief 4, by W. L. Busch, Illinois State Geological Survey, 1962, 9 pp. Summary of Illinois Mineral Production in 1960, Mineral Economics Brief 25, by W. L. Busch, Illinois State Geological Survey, 1961, 2 pp. Summary of Illinois Mineral Production in 1961, Mineral Economics Brief 5, by W. L. Busch, Illinois State Geological Survey, 1962, 2 pp. Summary of the Geology of the Chicago Area, Circular 460, H. B. Willman, Illinois State Geological Survey, 1971, 77 pp. "A Summary of the Uses of Limestone and Dolomites," by J. E. Lamar and H. B. Willman, Illinois Geological Survey Report Inv. 49, 1938, 50 pp. Surface Structure Map of Shelby, Effingham, and Fayette Counties, Report of Investigation 76, William A. Newton. Explanation and Summary: J. Marvin Weller and Alfred H. Bell, Illinois State Geological Survey, 1941, 21 pp., 1 pl., 2 figs. Surface Topography of Carroll County, Illinois (Map), Open File Series m 1997-13a, compiled by Christopher S. McGarry, Illinois State Geological Survey, 1997, Scale, 1:62,500, Size, 26 x 36 inches. Surface Topography of McHenry County, Illinois (Map), Open File Series m 1995-12, compiled by Melisa M. McLean, Maureen D. Kelly and Christopher S. McGarry, Illinois State Geological Survey, 1995, Scale, 1:62,500, Size, 38 x 30 inches. Surface Topography of Will and Southern Cook Counties, Illinois (Map), Open File Series m 1995-13a, compiled by Melisa M. McLean and Edward C. Smith, Illinois State Geological Survey, 1995, Scale, 1:100,000, 35 x 27 inches. Surficial Deposits of Illinois (Map), Open File Series m 2000-7, digitally adapted by Barbara J. Stiff, Illinois State Geological Survey, 2000, Scale, 1:500,000. Size, 35 x 51 inches. Surficial Geology Map, Jo Daviess County, Illinois (Map), Open File Series m 2000-8b, Matthew H. Riggs, Illinois State Geological Survey, 2000, Scale, 1:62,500, 29 x 48 inches, Computer-generated map. 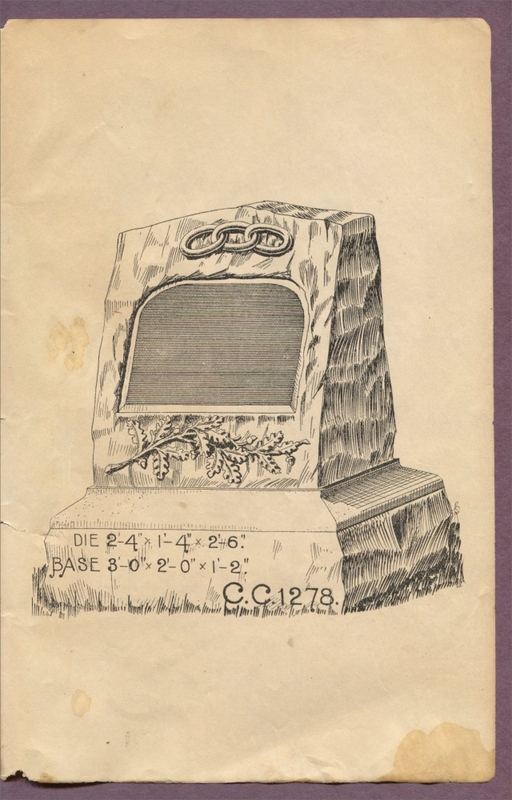 The Technology of Marble Quarrying, U. S. Bureau of Mines Bulletin 106, by Oliver Bowles, Washington: Government Printing Office, 1916. Thermal Expansion of Certain Illinois Limestones, Illinois Mineral Notes 24, by Richard D. Harvey, Illinois State Geological Survey, 1966, 6 pp. Three-Dimensional Geologic Mapping: A Pilot Program for Resource and Environmental Assessment in the Villa Grove Quadrangle, Douglas County, Illinois, Bulletin 106, Zakaria Lasemi and Richard C. Berg, editors, Illinois State Geological Survey, 2001, 117 pp. Topography of the Bedrock Surface in Will and Southern Cook Counties, Illinois (Map), Open File Series m 1995-13b, compiled by Melisa M. McLean and Edward C. Smith, Illinois State Geological Survey, 1995, Scale, 1:100,000, 35 x 27 inches. Turbidites and Other Sandstone Bodies in the Borden Siltstone (Mississippian) in Illinois, Circular 425, by Jerry A. Lineback, Illinois State Geological Survey, 1968, 29 pp. Typical Rocks and Minerals in Illinois, by George Ekblaw and Don Carroll, State of Illinois, Department of Registration and Education, State Board of Natural Resources and Conservation and Committee on Geological Survey, 1931, 80 pp. Unpublished Reports on Open File. IV. Stratigraphy and Areal Geology, Circular 220, by Lois Kent, Illinois State Geological Survey, 1956, 19 pp. Unrivaled Chicago, Chicago: Rand, McNally & Co., 1896. Uses of Limestone and Dolomite, Circular 321, J. E. Lamar, Illinois State Geological Survey, 1961, 41 pp. Visualization of Bedrock Resources in Lake County, Illinois (Map), Open File Series m 2003-12, 3-D, map compilation and interpretation by Hannes E. Leetaru, Michael L. Sargent, Matthew H. Riggs and Dennis R. Kolata, Illinois State Geological Survey, 2003, 2 map sheets (64" x 36"). Wedron and Mason Groups: Lithostratigraphic Reclassification of Deposits of the Wisconsin Episode, Lake Michigan Lobe Area, Bulletin 104, by Ardith K. Hansel and W. Hilton Johnson, Illinois State Geological Survey, 1996, 116 pp. West-East Cross Section in the Illinois Basin, Open File Series 1992-4, Ozark Dome, Missouri, to Rough Creek Graben, Western Kentucky: Michael L. Sargent, Janis D. Treworgy, and Stephen T. Whitaker, Illinois State Geological Survey, 1992. Western Illinois, Guidebook 6, Guidebook 6, by Charles Collinson, 1964, (Tri-State Geological Society 28th Annual Field Conference, October 17-18, Quincy, Illinois.) 30 pp. Western Stone Company Incorporation Papers, dated September 17, 1889, at the Archives of the Illinois Secretary of State. What About Our Minerals? A Quiz Book on the Geology and Mineral Resources of Illinois, Circular 124, Illinois State Geological Survey, 1946, Reprinted 1952, 24 pp. Working Together: Interpreting Illinois Geology, Illinois State Geological Survey Annual Report 2001, 60 pp. Worthen Reports, Vol. VI. Geology and Palaeontology, Illinois State Geological Survey, 1875, 538 pp., 33 pls. Geology: A. H. Worthen and assistants G. C. Broadhead and E. T. Cox. Palaeontology: Orestes St. John, A. H. Worthen, and F. B. Meek. Contents: Geology of Coal Measures (Summary) and of Clark, Crawford, Jasper, Lawrence, Richland, Wabash, Edwards, White, Hamilton, Wayne, Clay, Cumberland, Coles, Douglas, Williamson, and Franklin Counties, by A. H. Worthen; Geology of Bond, Fayette, Montgomery, Christian, Shelby, Effingham, Moultrie, Macon, and Piatt Counties, by G. C. Broadhead; Geology of Gallatin and Saline Counties, by E. T. Cox; Geology of Livingston County, by H. C. Freeman; Descriptions and Illustration of Fossil Fishes, by Orestes St. John and A. H. Worthen; Descriptions and Illustrations of Invertebrate Fossils from the Paleozoic Formations, by A. H. Worthen and F. B. Meek. (Accompanied by a geological map of the state. ), Geological Survey of Illinois. Worthen Reports, Vol. VII. Geology and Palaeontology, Illinois State Geological Survey, 1883, 374 pp., 31 pls. Geology: A. H. Worthen. Palaeontology: A. H. Worthen, Orestes St. John, and S. A. Miller. Contents: Economical Geology, by A. H. Worthen; Descriptions and Illustrations of Fossil Fishes in the Carboniferous Formations, by Orestes St. John and A. H. Worthen; Descriptions and Illustrations of Invertebrate Fossils, by A. H. Worthen and S. A. Miller, Geological Survey of Illinois. Worthen Reports, Vol. VIII. Geology and Palaeontology, edited by Joshua Lindahl, Illinois State Geological Survey, 1890. 879pp., 78 pls. bound separately, geologic map in text volume. Geology: A. H. Worthen. Palaeontology: A. H. Worthen, Charles Wachsmuth, Frank Springer, E. O. Ulrich, and Oliver Everett. Contents: Drift Deposits of Illinois and Economic Geology, by A. H. Worthen; Descriptions and Illustrations of Fossil Invertebrates, by A. H. Worthen, of Fossil Crinoids and Blastoids, by Charles Wachsmuth and Frank Springer, and of Fossil Sponges and Fossil Bryozoa, by E. O. Ulrich and Oliver Everett; appendix consisting of Bibliography of A. H. Worthen, by N. W. Bliss and C. A. White, and General Index to the Eight Volumes, by Joshua Lindahl, Geological Survey of Illinois. Year Book For 1906: Administrative Report,...Illinois Fire Clays, Limestones Available as Fertilizers, Analysis of Silica Deposits, None Contributions to the Study of Coal, Stratigraphy Work in the Vicinity of East St. Louis, Geology of Calhoun County, Water Resources of the Springfield Quadrangle, Mineral Industry in 1906, Bulletin 4, H. Foster Bain, Director Urbana: Illinois State Geological Survey, 1907, 260 pp. Year-Book for 1907, Bulletin 8, H. Foster Bain, Director, Illinois State Geological Survey, 1908, 391 pp. Year-Book for 1908, Bulletin 14, by H. Foster Bain, Director, Illinois State Geological Survey, 1909, 394 pp. Year-Book for 1909, Bulletin 16, by Frank W. DeWolf, Acting Director, Illinois State Geological Survey, 1910, 402 pp. Year Book For 1910: Administrative Report and Various Economic and Geologic Papers, Mineral Production in 1909 and 1910, Carlyle Oil Field, Carlinville Oil and Gas Field, Geology and Mineral Resources of The Springfield Quadrangle, Extinct Lakes in Southern and Western Illinois and Adjacent, Bulletin 20, by G. H. Cady, et al., Urbana, 1915, 165 pp. Year Book for 1916: Administrative Report and Economic and Geological Papers: Mineral Resources of Illinois in 1916, Clay Deposits near Mountain Glen, Union County, Structure of the LaSalle Anticline, Bulletin 36, by W. DeWolf, et al., Urbana, 1920, 188 pp. Year Book For 1917 and 1918; Geology and Mineral Resources of 1) Edington and Milan Quadrangles, and 2) Avon And Canton Quadrangles, Bulletin 38, by F. W. DeWolf, et al., Urbana, 1922, 474 pp.